We consider the honeycrisp apple to be an excellent eating and cooking apple. They are crisp with a sweet-tart flavor. 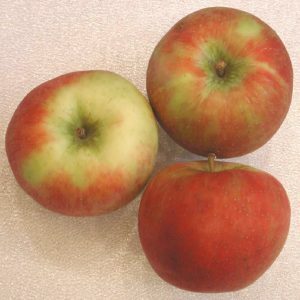 Honeycrisp apples were produced from a cross of Macoun and Honeygold apples. The skin color is 60 to 90 percent distinctive mottled red over a yellow background. A nearly solid red coloration develops only if the fruit is well exposed to the sun (the variation in color can be seen in the photo). In the red portion of the skin are small greenish-yellow dots. We could not find specific nutritional information for this variety, but have included general nutritional information on apples.